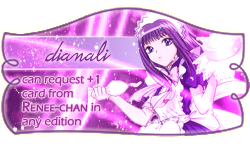 This month's challenge is based on Romance Anime. Previously seen is not allowed. All entries have to be watched within the challenge period. All entries have to be tagged with Romance. Each episode has to be 15 min or longer. Objective: finish 2 TV type (11+ episodes each) and 2 movies. However, if you have watched ALL on the list, you can choose to watch any that has romance tag. You're allowed to watch the sequel to any series listed above. Once you completed the challenge, post the following code to this thread. 2. [✔︎] Kokoro ga Sakebitagatterunda. 4. Movie -Kokoro ga Sakebitagatterunda. Start Date: Aug 1st, 2017. End Date: Aug 5th, 2017. 4. Movie - Kokoro ga Sakebitagatterunda.